Keeps your grill looking new, year-round. Great for use on both gas & charcoal grills..
Use on exterior and interior of the grill. Fast working degreaser formula reduces scrubbing time and effort. Cleans away flaky carbon buildup that accumulates. Helps remove oily residue on grates. Click here to view all 303 Products. Usage Directions: Store product in a closed and upright position. Grill should be turned off and cool to the touch before applying this product. Remove any food from area before cleaning. To Clean Interior of Grill: Remove any excess charred food and debris from grates before using. Spray product directly onto grate and allow 1-2 minutes for product to start degreasing. For heavily soiled areas, additional soak/wait time may be needed. 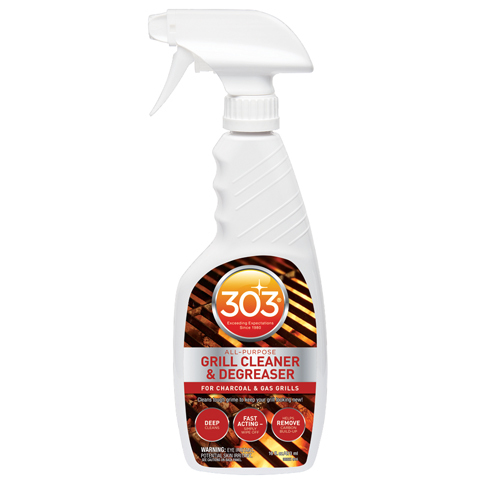 Use grill brush to help aid in the cleaning action, and to help remove stubborn debris. Wipe surface with a clean damp cloth or sponge. To Clean Exterior of Grill: Spray product onto surface and wipe dry with a clean damp cloth or sponge. For extremely dirty surfaces, additional applications or soak time may be required.